Donald Trump tweets that “All of Asia is thrilled” that North Korea has halted missile testing and only the “Opposition Party” Democrats, including the “Fake News” is complaining. Halt testing missiles but judging by the recent satellite photos, they are still doing work on them. How does the media doctor photos from his own administration and display them? Trump also claims “If not for me, we would now be at War with North Korea!” Let’s see. If anything the US and North Korea were closer to war than probably any of the past few administrations. Did North Korea fire missiles towards Japan or elsewhere prior to this administration? Or fire missiles that often? Experts say there is no proof North Korea’s halt of nuclear and missile tests means the North will take concrete steps to give up such weapons. They also say the U.S. has an unrealistic approach to North Korea’s denuclearization. Environmental Protection Agency Administrator Scott Pruitt resigned [or maybe he was fired] amid ethics investigations of outsized security spending, first-class flights and a sweetheart condo lease. Pruitt, at one point, directly appealed to Trump this spring to fire Attorney General Jeff Sessions and let him run the Department of Justice instead. In an Oval Office conversation with Trump, Pruitt offered to temporarily replace Sessions for 210 days under the Vacancies Reform Act, telling Trump he would return to Oklahoma afterward to run for office. Deputy Administrator Andrew Wheeler, a former coal industry executive, will assume the acting administrator position. Poor guy. He was a lobbyist and a lawyer. The federal Vacancies Reform Act of 1998 gives the President the authority to temporarily fill a vacancy at a federal agency if the official “dies, resigns, or is otherwise unable to perform the functions and duties of the office.” Obviously Sessions didn’t die or resign and is able to do his functions and duties. So good luck there Scott! With the way Pruitt has handled his own department [see below] – let alone his own life – I am sure Trump did the right thing [for once] and turned him down. Hopefully after Pruitt left, trump had a good laugh. I know I would of. Meanwhile, Pruitt and his aides have kept “secret” calendars and schedules to overtly hide controversial meetings or calls with industry representatives and others, according to a former EPA official who is expected to soon testify before Congress. A review of EPA documents found discrepancies between Pruitt’s official calendar and other records. Everything that was spent by him during his tenure hit over $4 million. At a rally, Trump mocked the #MeToo movement as he repeatedly attacked Massachusetts Sen. Elizabeth Warren over her heritage by saying “I want to apologize. Pocahontas, I apologize to you. I apologize to you. To you I apologize,” he said. “To the fake Pocahontas, I won’t apologize.” He has called Warren Pocahontas a few times previously. And if she won the Democratic nomination for 2020 he would ask her to take a DNA test to prove she has Native American blood in her. Like a true racist he used the word “Indian” in his further comments. Not surprise, Trump also defended Republican candidate Rep. Jim Jordan against allegations he overlooked sexual abuse during his time as a wrestling coach at Ohio State University. Trump then attacked, without naming him, Arizona Sen. John McCain for voting against Republican efforts to repeal the Affordable Care Act and he mocked President George H.W. Bush’s slogan during his rally. Trump’s Mar-a-Lago Club has applied for permission to hire originally 40 foreign workers to serve as waiters and cooks during the winter social season in Palm Beach, Florida. Trump’s club has asked to hire another 21 who would be cooks from overseas and employ them from October to May. The postings show that – despite Trump’s insistence that immigration is holding down wages and crowding out native-born American workers – his club believes it cannot find any Americans in South Florida who are qualified to hold two very common restaurant-industry jobs. Mar-a-Lago’s pay for cooks starts at $13.31 per hour, down 3 cents from the year before. The base salary his club is offering to waiters is higher in 2018: It rose from $11.88 per hour last year to $12.68 per hour this year. Trump appeared to rely on a dubious Fox News report to unleash an attack on his predecessor, accusing President Barack Obama, without any real evidence, of granting citizenship to 2,500 Iranians as part of nuclear deal negotiations. Fox News’ website cited an Iranian news agency that cited an Iranian newspaper that quoted the single Iranian cleric who is also a member of the country’s parliament. In a whacky bit of news, at a meeting in August 2017 in the Oval Office to discuss sanctions on Venezuela was concluding, Trump turned to his top aides and asked an unsettling question: With a fast unraveling Venezuela threatening regional security, why can’t the US just simply invade the troubled country? The suggestion stunned those present at the meeting, including U.S. Secretary of State Rex Tillerson and national security adviser H.R. McMaster, both of whom have since left the administration. Breaking with their House Republican counterparts, the Senate Intelligence Committee said that the intelligence community properly concluded in January of last year that Russian President Vladimir Putin was trying to help Donald Trump when Moscow meddled in the 2016 election. Special counsel Robert Mueller is tapping additional Justice Department resources for help with new legal battles as his year-old investigation of Russian interference with the 2016 election continues to expand. He is making more use of career prosecutors from the offices of U.S. attorneys and from Justice Department headquarters, as well as FBI agents — a sign that he may be laying the groundwork to hand off parts of his investigation eventually. The White House announced that former Fox News president Bill Shine has been appointed as the White House’s new Deputy Chief of Staff for Communications. Shine was one of Roger Ailes [the former chairman of the Fox News Channel] deputies for years. When Ailes was accused of sexual harassment by numerous women in 2016, Shine was accused of covering up the alleged misdeeds. Trump is demanding that Norway ramp up its defense spending as a NATO partner, according to a letter he wrote to Prime Minister Erna Solberg. The letter was one of a series that Trump sent to NATO allies, including Germany, Belgium, Canada and others, demanding they boost spending and threatening to shift the US military presence in Europe if they do not. According to a report, a draft of a bill from the Trump administration would propose having the US abandon key World Trade Organization principles and offer Trump significantly more discretion over US trade policy. The proposal would give Trump the authority, based on the administration’s assessment of trading policies between nations, to renegotiate or apply tariffs as he sees fit to push individual countries on trade. White House press secretary Sarah “Simpleton” Sanders says that Trump is always seeking “good trade deals”. Imposing tariffs is not the right way of doing this. She, meanwhile, also said that during the G7 summit in Canada that Trump proposed that Canada remove all tariffs and subsidies. Of course he said nothing about removing all of the US tariffs imposed on Canada. She also said that “the US is very nice to Canada” and that Canada took “advantage” of the US. Sure Sarah. Trump said the World Trade Organization treated the US “very badly”. Hmmm. If you impose tariffs and other trade issues that are imposed for no real reason, what do you expect when you lose probably every trade dispute. By leaving the WTO he doesn’t have to worry about any court cases. With a new Mexican President, Trump couldn’t wait to say that he had already talked to Mexico or but the Mexican president mentioned nothing about bilateral trade deal. Unsure if Trump wants a NAFTA trade deal or not. First he wanted to wait until after the Mexican election this past weekend. Now he says he could wait until after the mid-term election which actually could make sense if he thinks he can get a large majority in the Senate that he has now. Good luck there. July 1st was Canada’s 151st birthday. So the US Ambassador to Canada, Kelly Craft, decided to have a party in Canada’s honor. But no senior government official will attend. The opposition Conservative Party will have maybe 2 senior party members. Why? Protesting against the US tariffs imposed on Canada. In the end, while previous parties usually had 4,000 [!!!] invitations, this one had about 1,000 and excluded a chunk of Ottawa’s [Canada’s capitol] elite. Canada through $13 billion US tariffs at the US on July 1st. Like the European Union, the tariffs were aimed at specific states where Trump is more popular. More than 40 US steel products attract tariffs of 25%. A tax of 10% has been levied on over 80 other American items including toffee, maple syrup, coffee beans and strawberry jam. Health and Human Services Secretary Alex Azar now estimates that under 3,000 kids who may have been separated from their parents are in government custody — a figure far higher than his department released just recently. HHS had previously reported that it had 2,047 children from separated families in its care. Approximately 100 children under the age of 5. Merriam-Webster Dictionary’s official Twitter page mocked Trump over misspelling “pore” in a tweet where Trump was bragging about his writing ability. Write if you can get work like this: Trump’s 27 year old assistant’s salary was $95,000 last year [matching President Obama’s last assistant] and is now at $135,000. Michael Cohen dropped the reference “personal attorney to President Donald J. Trump” from his Twitter biography recently. A new Quinnipiac University poll has a striking result: 49% of people said they believe Trump to be a racist while 47% believe he is not. I guess you can call this good news: The current version of the National Defense Authorization Act (NDAA) includes provisions that place restrictions on the president’s authority to direct generals to launch cyberattacks. NDAA in its current form also requires the president to develop and abide by a cyberwarfare strategy document that describes which activities merit cyber retaliation. It also could limit retaliatory attacks by the military without a certain level of confidence in attribution. Republican and Democratic leaders aren’t quite celebrating Donald Trump’s historic meeting with North Korea’s Kim Jong Un, saying the initial agreement they struck won’t mean much unless the North completely denuclearizes. The agreement on the North Korean side seems more like a pledge. Trump agreed to stop military maneuvers with South Korea and remove the US military from there as well but no other details. The 28,500 personnel would return home and Trump claims this is to save money. Seems nothing was done with North Korea’s human rights records where for the simplest crime, it can send you to as gulag for years. Or shot at a firing squad or even blown up [the former is what he did to his own uncle]. Is Trump doing this to show he did something that no US leader in the last 60+ years could do and/or to increase his chances of getting a Nobel Peace Prize. Seems his critics said he gave everything away and got nothing in return as North Korea has previously reneged on deals. The Trump-Kim agreement does not define what denuclearization would mean. Wonder, as well, if this is a way for the North Korea to invade as the South Koreans could be defenseless. Trump called Un someone he can trust and talented… Sure. Even an invitation to invite Un to the White House. Trump had left the summit early [and he showed up at the Saturday morning talks late], supposedly to get to Singapore early for him meeting with Kim Jun Un. But he may have also left early because the last topics weren’t to his taste: environment and climate control. It wasn’t just Trudeau who spoke after left. Trudeau’s comments were made before, during and after the summit – even to Trump in private meetings. Did this really upset Trump or maybe Trump felt he wasn’t the big winner at the summit [for his ego]. While Trudeau did it at a press conference, Trump’s remarks were on [of course] Twitter where no real reports can question him. Coward. As for the communique, all seven leaders had agreed to what it said. To rescind it later for something another leaders said and not the contents of the communique is childish. After saying that they are close to a deal in NAFTA, there are some hints that this spat could even halt or slow down the talks. Seriously? Trump even said at one point that his relationship with the other leaders is “a 10”. This was before his Twitter comments and reneging on the communique. Peter Navarro, a trade adviser to Trump, said “There’s a special place in hell for any foreign leader that engages in bad faith diplomacy with President Donald J. Trump and then tries to stab him in the back on the way out the door.” Great diplomacy there Peter. Hilariously, Navarro said Trump “did the courtesy to Justin Trudeau to travel up to Quebec for that summit” and that Trump had “bigger things on his plate” than the G7 meeting. What leader has never attended a G7 summit? Navarro late did apologize. Trump, in a tweet, asked why the US should allow countries to continue to make “massive trade surpluses,” asserting that it is “not fair to the people of America” and that the US is suffering under a “$800 billion trade deficit.” Whining again. Does he know economics? Would other countries’ leaders be whining about this subject? The US is a country that needs more resources than sales. In some cases, those resources are cheaper to bring in from elsewhere than manufacture domestically. “Germany pays 1% (slowly) of GDP towards NATO, while we pay 4% of a MUCH larger GDP. Does anybody believe that makes sense? We protect Europe (which is good) at great financial loss, and then get unfairly clobbered on Trade. Change is coming!” Didn’t he say changes were coming last year? Trump has whined about the tariffs protecting the Canadian industry when he forgets [or did he] that his government gives the US industry $22 billion in subsidies. 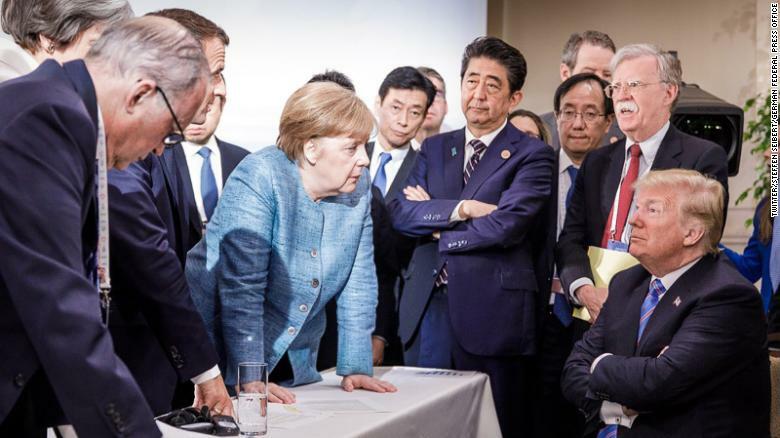 France and Germany have criticized Trump for threatening to pull the United States out of a joint statement with key G7 allies. This picture says it all. This comments is sort of the equivalent of a mass murderer getting pardoned because it happened a couple of years ago and not on his “watch”. The other G7 counties [except Italy] plus the European Union do not want Russia to be back in the group as long as Crimea is in Russia’s hands. Trump told French President Emmanuel Macron during their recent meeting in Washington that there are too many German cars in the United States. The source did not say that Trump explicitly said he wanted all German-made cars out of the US. Trump declared he thinks the Russia probe is “very biased” and has reservations about being interviewed by special counsel Robert Mueller, raising more questions on whether he will consent to an interview as part of the investigation. Not even a month ago he said he wanted to be interviewed. He [of course] didn’t say what changed his mind – if anything – but he changes his mind as often the stock market index changes. Trump’s comments came a day after the Justice Department watchdog released a report critical of how former FBI Director James Comey handled the 2016 Hillary Clinton email probe. The report contained messages from FBI agents who spoke critically of Trump. Unsure how you equate FBI agents and a separate investigation by Mueller who isn’t even using FBI agents. The report didn’t find evidence that political bias influenced the investigation of Clinton’s email practices prior to the election. Trump sought to further discredit the probe, saying the “problem with the Mueller investigation is everybody’s got massive conflicts.” And he doesn’t? He reiterated his longstanding contention there was no collusion between his campaign and Russians and the report exonerates him. He has said this before. The report isn’t really about him directly. Trump tweeted “I worked hard on this, along with a Great Team of talented people” when asked about the US co-hosting the winning bid for the 2026 FIFA World Cup. He sent signed letters [I’m sure written by someone else] to the FIFA President Gianni Infantino. Then he spoiled things by saying “Why should we be supporting these countries when they don’t support us (including at the United Nations)?” to those nations that did vote for the Canada/Mexico/US bid. There is talk of a bipartisan bill where announcements of tariffs would be removed from a president’s hands and to Congress. Woops. EPA administrator Scott Pruitt is in trouble again. It seems and aide and donors used their pull to find a job for Pruitt’s wife. When will he lose his? Trump hit back at Robert De Niro, calling him a “very low IQ individual,” after the Oscar-winning actor’s expletive-laden attack on the American president on live television for the Tony Awards. The network has a delay – so most Americans didn’t hear what Bobby said. Trump said he had watched the clip “and (I) truly believe he may be punch drunk.” I would guess prior to this De Niro is/was one of Trump’s favorite actors. Fox News criticized former President Obama for his willingness to “talk to dictators.” Now, conservative media praises Trump’s work with North Korean leader Kim Jong Un. The Trump administration is creating an office within the agency that grants US citizenship to root out fraudsters and have their citizenship taken away. The targets are people who have already been rejected from the US, but who create a new identity to gain citizenship afterward. A 2016 Homeland Security Department Inspector General report found that at least 858 people had been given US citizenship despite having been deported under a different identity, because their fingerprints had not been in the system. Congressional Republicans distanced themselves from the Trump administration’s policy of separating children from their parents at the southern border, even as the White House cited the Bible in defending its “zero tolerance” approach to illegal border crossings. “I can say that it is very biblical to enforce the law. That is actually repeated a number of times throughout the Bible,” said White House press secretary Sarah “Simpleton” Sanders. When a reporter asked about her “very biblical” remark, Sanders suggested he was taking her words out of context, adding: “I know it’s hard for you to understand, even short sentences, I guess.” She sounds like her boss. Trump accuses the Democrats of causing the problem with the separated children but he refuses to sign any bills that would fix the problem since he entered office. There are at least 2000 children separated from their parents in a period of 7 weeks. Yet the policy of separating children began this April. Former Trump campaign chairman Paul Manafort will await his trial for foreign lobbying charges from jail. Two weeks after Robert Mueller’s prosecutors dropped new accusations of witness tampering on him, US District Judge Amy Berman Jackson revoked Manafort’s bail, which allowed him out on house arrest. Trump tweeted after ” Didn’t know Manafort was the head of the Mob.” Yes. Trump is a mob boss. Last week, Mueller’s team alleged they found evidence Manafort had tried to tell possible witnesses in his case to lie about their lobbying efforts under him in the US. The witness tampering allegations, which also resulted in new criminal charges, were enough for him to lose his house arrest privileges. China accused the United States of firing the first shot when the White House said that it would impose tariffs of 25% on $50 billion worth of Chinese goods. The Chinese government said it would respond in kind to the US tariffs, which will apply to roughly 1,100 exports and will target China’s aerospace, robotics, manufacturing and auto industries. Beijing will impose tariffs on 545 US items worth $34 billion [same amount as the first wave of American tariffs] starting on July 6. Tariffs on the remaining 114 items will start later. Trump endorsed GOP Senate candidate Corey Stewart, a candidate who the National Republican Senate Committee is refusing to endorse for his extreme views. With this busy week, looks like I will add another posting early next week! Watch the White House Correspondent’s Dinner? Main even Michelle Wolf made some zingers – both positive and negative. Maybe a bit over the line for a few. Donald Trump said the annual correspondents’ dinner was “an embarrassment.” He called comedian Michelle Wolf’s stand-up act “filthy.” He should know about filthy. Remember that tape of him for Access Hollywood. “Everyone is talking about the fact that the White House Correspondents’ Dinner was a very big, boring bust … the so-called comedian really ‘bombed. '” According to you maybe. White House Correspondence Dinner President Margaret Talev says she’ll work with the next president on “the format of the dinner going forward.” I guess she won’t work with Trump then. Trump did not attend the annual correspondents’ dinner as he was doing an election style rally in Michigan. There, Trump told supporters during a 90 minutes speech that if Congress did not meet his funding demands for border security, he may support a government shutdown this fall. Despite his campaign pledge to make Mexico pay for his proposed wall on the US-Mexico border, Trump has demanded that Congress fund the project. In March, he signed a bill that funds the government through September that included $1.6 billion for border security, but not the wall. For the leader of the nation, where his part has majorities in the House and Senate, he has really done nothing. In the nearly 50 questions “leaked”, there were about a dozen questions related to collusion and yet after the leak, Trump tweeted “There was no Collusion (it is a Hoax) and there is no Obstruction of Justice (that is a setup & trap).” I guess he doesn’t know the definition of collusion. The questions were compiled by Trump’s lawyers during negotiations with Mueller’s investigators earlier this year over the prospect of a presidential interview. There was talk as far back as March where Mueller’s team would decide to subpoena Trump as part of the investigation, he could still fight it in court or refuse to answer questions by invoking his Fifth Amendment protection from self-incrimination. Trump said that his personal attorney, Michael Cohen, was paid via a monthly retainer and flatly denied that any campaign money was used to reimburse Cohen for the hush agreement with Stormy Daniels. But just a month ago when the payment first appeared, Trump said he knew nothing about a $130,000 payment. Former New York City Mayor Rudy Giuliani, who is one of Trump’s personal lawyers, told Fox News that Trump paid back Cohen the $130,000 that was used to pay off Daniels. Giuliani said Cohen was “definitely reimbursed” and was “not campaign money”. [That’s one heck of a monthly retainer!] Trump had repaid Cohen over several months, indicating the payments continued through at least the presidential transition, if not into his presidency. No debt to Cohen is listed on Trump’s personal financial disclosure form, which was certified on June 16, 2017. “Neither the Trump Organization nor the Trump campaign was a party to the transaction with Ms. Clifford [Daniel’s real name], and neither reimbursed me for the payment, either directly or indirectly,” Cohen said in February 2018. He notably did not include the president personally. Trump is probably changing his mind when it comes to Giuliani after he said “he’ll get his facts straight.” Aside from Giuliani opening his mouth regarding the $130,000 payment to Story Daniels which contradicted Trump’s early claims, Giuliani then announced that three US prisoners would be freed from North Korea, but the day after no administration officials were confirming that. Now Giuliani says he was given the wrong information and assumed some of the facts. Cohen gained access to lines of credit worth as much as $774,000 as Trump’s campaign entered the primaries. Exactly why does he need lines of credit? Pruitt paid himself nearly $65,000 in reimbursements from his two campaigns for Oklahoma attorney general. This goes against two campaign finance rules: transparency about how campaign funds are spent and ensuring campaign funds are not used for personal purchases. Trump called for Montana Democratic Sen. Jon Tester to resign over his opposition to White House physician Ronny Jackson’s nomination for secretary of veterans affairs, saying some of the allegations against Jackson “are proving false.” Tester had raised concerns about allegations against Jackson, including that he loosely handled prescription pain medications, was intoxicated during an overseas trip, and created a toxic work environment. Good luck there Donnie. Meanwhile, reports say Jackson will not return to his role as Trump’s personal physician. Vice President Mike Pence’s physician privately raised alarms within the White House last fall that Jackson may have violated federal privacy protections for a key patient — Pence’s wife, Karen — and intimidated the vice president’s doctor during angry confrontations over the episode. Memos from Pence’s doctor suggested White House chief of staff John Kelly was aware of the episode. Jackson and the White House have continued to deny allegations of misconduct, and Jackson’s defenders in the White House said that the episode involving Mrs. Pence was simply a dispute between two doctors with a strained relationship and that he had acted appropriately. Not surprising, Trump spoke at the National Rifle Association’s annual meeting in Dallas. It will be one right wing love fest. Trump’s fourth year bin a row speaking and even though Pence would also be speaking. Trump at one point floated raising the age of purchase for certain guns to 21 and proposed expanding background checks, including proposals opposed by the NRA. But after meeting with the NRA’s leaders, including its top lobbyist, he ultimately backed only modest proposals that the gun lobby supports. The NRA spent more than $30 million to help elect Trump in the 2016 presidential election. “Senator John Cornyn, been with me right from the beginning.” Actually Cornyn revealed that Trump wasn’t his first choice for the GOP presidential nomination. “Your Second Amendment rights are under siege, but they will never, ever be under siege as long as I’m your president.” Actually, the Democrats never have said this but Trump likes saying it as if they would pull it. “Kanye West must have some power because you probably saw, I doubled my African-American poll numbers. We went from 11 to 22 in one week.” This was taken by a pollster than is unreliable according to most. “And they voted for me, and we won.” Nope. Trump won 8% of the African-American vote in 2016. “Can you imagine, if we ever called for a rally in Washington, DC? There wouldn’t be enough room.” Just as big as his inauguration. “We are going to have to outlaw, immediately, all vans and all trucks, which are now the new form of death for the maniac terrorists. Right?” In addition to his second amendment foolishness, he is now saying the Democrats will ban vans and truck. Seriously. “President Obama was very nice to us, because he left us a lot of judges.” Actually, McConnell blocked many of Obama’s nominations which left many openings – some are still open. “Ninety-eight percent of mass public shootings have occurred in places where guns are banned, just so you understand.” Coming from a questionable research but includes shootings where people bring in guns to banned areas. House Speaker Paul Ryan said he accepts the decision by the Rev. Pat Conroy, the House chaplain, to rescind his resignation. Some suggested a non-Catholic priest was needed. Emmet Flood, who represented then-President Bill Clinton during his impeachment process in the late 1990s, is expected to join Trump’s legal team at the White House. Trump is planning a trip to Britain, his first since taking office. On July 13th. It will not be a state visit. There are already extreme 6 Republicans trying to win the nomination for the party. These 6 have [among other things] one or more of felonies, anti-LGBTQ, white supremacist, anti-black, Holocaust denier, neo-Nazi, conspiracy theorist, anti-immigrant and anti-Latino.